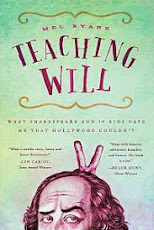 I was curious how Richard from Texas was impacted by his experience of touring "A Midsummer Night's Dream" as Snug the Joiner. Last November our DREAM TOUR group met in Reunion. 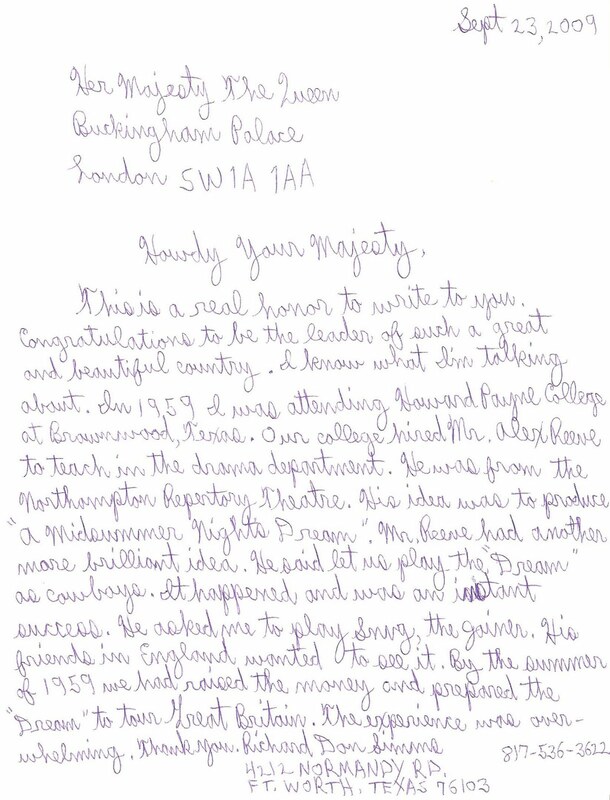 I wrote a letter to THE QUEEN of ENGLAND to tell her about our 1959 TOUR. There were 17 of the original group met with family. We honored the head of the Speech Dept. and his wife Dr. and Mrs. MacDonald W. Held. We had a lot of stories and pictures to go through. 50 years after the DREAM TOUR. I like that Richard addresses both her Majesty and me with the same "Howdy." Howdy Mel, Do you believe this? 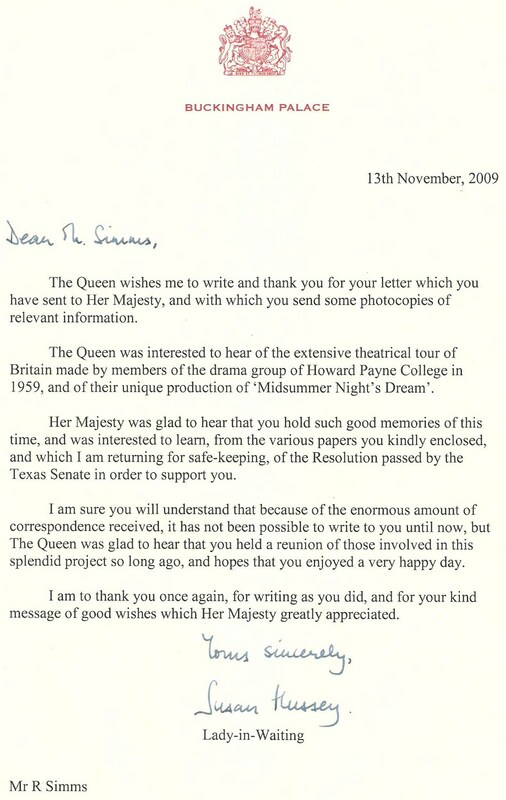 In Sept. 2009 I wrote to THE QUEEN to tell her about the 1959 TOUR. Go to the Reunion and tell 'em. I wrote to THE QUEEN. Some chuckled. 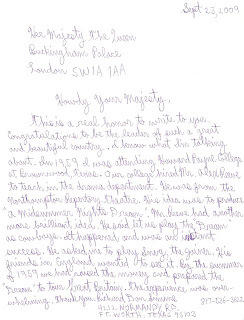 Then Nov. 21,2009 I received this letter from the Lady-In-Waiting. 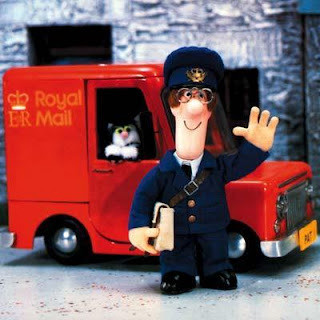 I opened that big brown envelope from BUCKINGHAM PALACE. 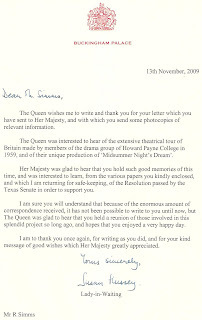 What an honor to receive a letter from HER MAJESTY. I tell everybody about it. Nobody in my family has ever gotten a letter from THE QUEEN OF ENGLAND. The chuckles have stopped. The letter is in a safe place.